The Nikon Eclipse Ci-E offers the most advanced ergonomics, durability and an unsurpassed view wrapped into a fully automated, compact design. “Feel the Evolution” through the simultaneous switching of the objective lens, condenser and light intensity so you can concentrate solely on the specimen without concern for microscope operation. “See the Evolution” through the revolutionary combination of patent pending fly-eye technology and the world renowned CFI60 optical system. 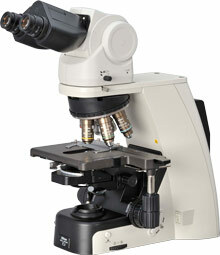 The Ci-E incorporates a high-intensity LED optical system that is IR-free, significantly minimizing eyestrain for users spending long hours at the microscope. LED illumination also offers very low power consumption and heat generation and eliminates color temperature changes that occur with halogen light sources. A variety of microscopy techniques are supported, including darkfield, simple polarizing, and sensitive color polarizing for gout testing and phase contrast.